Now is a good time to establish a foolproof weed-management plan for your operation to make it easier to face even the most troublesome weeds later in the season. 1. 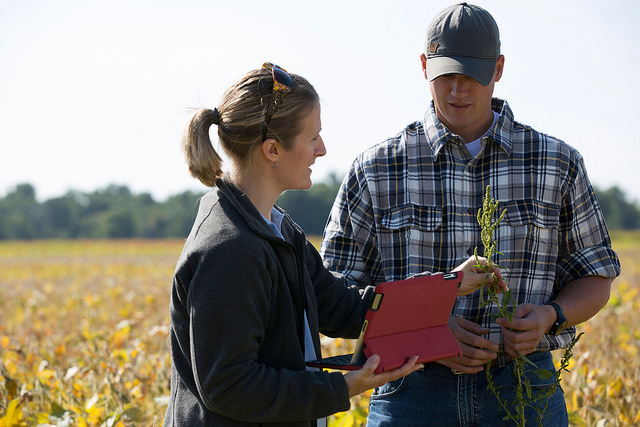 Analyze Your Fields and Your Inputs – Knowing each field, its soils and troublesome weed areas is crucial in planning for success. Weed management involves planning ahead for specific situations, not just reacting when weeds pop up. Steckel suggests strategizing where to place herbicides. “If one field has a pigweed problem worse than another field, apply glufosinate (Liberty®) to the troublesome field only to keep your technologies mixed up.” Crop rotation and planting in narrower rows are other options to consider. 2. Start Clean – Starting with a weed-free field can increase your chances of a successful season. Tillage practices are a viable pre-plant weed-control option for some areas. In other regions, where farmers practice no-till, Steckel suggests the use of paraquat (Gramoxone®) to ensure a clean start. Paraquat is deactivated on contact with the soil, meaning that it can be sprayed to burn down weeds before planting without risking crop damage from root uptake. This fast-acting herbicide vegetative residue can help prevent soil erosion and is ideal in no-till operations. 3. Post-Emergence Options – Applying a pre-emergence herbicide is a fundamental part of weed management and must be done for any chance of success. “Weeds that come up with the crop or shortly thereafter are by far the most competitive and will cause you the most problems,” says Steckel. Therefore, if spraying a pre-emergence herbicide is simply not an option before your soybeans emerge, applying a herbicide with residual activity as soon as possible after planting is critical. 4. Preserve Existing Herbicide Technologies – Although you may soon have access to new seed technologies, like Enlist™ and Roundup Ready 2 Xtend, no new herbicides will hit the market anytime soon. That means you need to maintain the usefulness of what is currently available. Knowing your weeds and which herbicide combinations provide maximum control will help you determine which groups of herbicides remain effective. Steckel says the key is using at least two modes of action and tank mixing with group-15 herbicides, the long-chain fatty acid inhibitors that work to inhibit cell growth and division in weeds. 5. Bottom Line: Don’t Skimp on Weed Management – Even in lean years, weed management is not an area to cut corners. “Cutting back on herbicides is not an option at all,” says Steckel. “Cutting back will not only hurt you this year, but you will struggle with the weeds produced for years to come.” Analyzing the probability of return on investment for other inputs may allow you to cut back elsewhere, but establishing a solid weed-management plan is a priority to effectively fight weeds and sustain herbicide use for years to come.